More than 1,600 flights within, into or out of the US were canceled Monday, according to FlightAware.com. Chicago's O'Hare International Airport was hit particularly hard, with more than 1,300 flight cancellations and delays averaging more than 40 minutes because of heavy snowfall. The storm brought heavy snow from Colorado and Wyoming, where up to 60 inches of snow fell, through the Midwest, including Iowa, which got up to 17 inches. The storm hit the Chicago area hard, with more than 7 inches of snow, making it the strongest November storm since 1975 and the fifth-largest on record for the month. At the peak of the storm, more than 220,000 customers were without power in the Midwest, particularly in the Chicago area. Early Tuesday more than 67,000 Illinois customers remained without power. Winter weather warnings and watches have shifted toward New England where heavy snow will continue into Tuesday. Temperatures in the major metro areas of the Northeast warmed on Monday, so those cities received rain and wind. Wind gusts reached over 40 mph for New York City metro area, Boston and Philadelphia. The rain will subside overnight into Tuesday but it will remain breezy and cold through midweek. As the storm moves to the Northeast, another low pressure system will develop along the coastline causing heavy snow to fall over northern New England, with over a foot possible in some areas. Cold air moving in behind the storm will bring heavy lake-effect snow, with up to 20 inches expected just south of Buffalo, New York, on Tuesday into Wednesday. The storm disrupted travel for many on the last day of the holiday week. Kansas Gov. 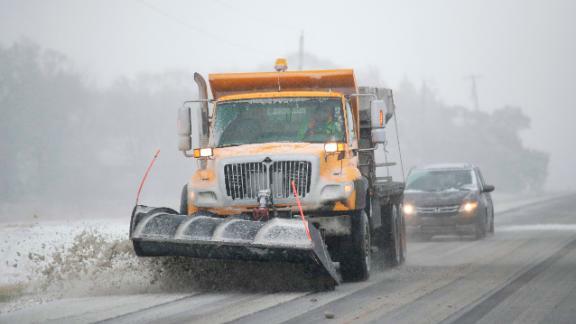 Jeff Colyer issued a state of emergency declaration for the state on Sunday and officials said road conditions were "treacherous" in some areas. More than 1,700 US flights were canceled Sunday, with delays to 5,091 flights, according to FlightAware. Most were at Kansas City International Airport and Chicago's O'Hare International and Midway airports.